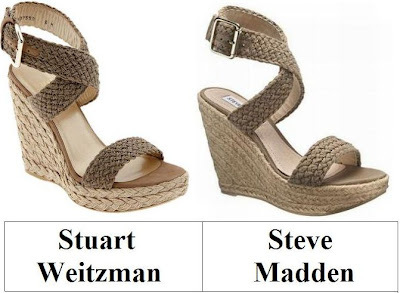 Mes chers, in the left corner you will spot Stuart Weitzman’s sassy Alex Espadrille – the very same sandals seen donned by the glamorous Jennifer Aniston and Eva Mendes; in the right corner cast a glance upon Steve Madden’s tres fabulous Fantasik Sandals. Though the wondrous Weitzman’s feature leather trim and an insole lined with suede, two aspects that the Madden’s are missing; for a mere $69.00, in comparison to the $365.00 of the ambrosial Alex, they are every bit as wondrous as their haute couture counterparts, and allow the frugal fashionista to indulge in a splash of star style on a budget! Tell me, kittens…will you be a big spender and go for Stuart Weitzman, or be thrifty and spring for Steve Madden? Thanks to Endless and Dillard’s for the pictures. Steve Madden. They look so similar to the realty expensive ones! I am usually not a fan of espadrilles but I like these. I might have to consider them for the spring. Now to find something to wear them with! I love them! They make me crave spring even more! I'm tired of wearing boots. Great shoe for the spring and summer with a cute hat and dress! Def would go for the Steve Madden shoes, they look so close to the others! Erika those steve maddens make me want to go somewhere warm! I love how classic they are. I love simple shades on summer shoes because then you can go crazy with nail polish!! I'm so happy that you found a thrifty find like this. They look so similar, but I'd rather stick to the Steve Maddens. There's a Steve Madden store at one of my favorite malls and I'd be crazy not to pick them up. BTW, snow days are pretty nice when you're in the comfort of your own home. They're not pretty if you have to go outside. Have an awesome Thursday. Love them both but the price difference is big. It looks like the Stuart Weitzman are a bit higher, right? I keep the Steve Madden. WOW, they look the same! But I have to agree with Maddy: the quality of Steve Madden shoes is amazing! awesome spring fling shoe. Cool price that would still be a lot out of my wallet. But I so love it. awww i love them both. Been planning to buy that shoes too. I am a Madden Girl all the way! Great find! i'd have to go for the stuart weitzman ones, they are perfection! Those Steve Madden wedges look really gorgeous and so affordable - total must have for the summer. Great find!!! THIS IS SO FUNNY!! I JUST BOUGHT THOSE SHOES YESTERDAY. I HAD TORN THEM OUT OF MAGAZINES TWICE AND FINALLY PULLED THE TRIGGER. OBSESSED!! Ooooooooh these make me so excited for spring! I'd pick the Weitzmans just because I love how pronounced the braids are. I love the details on the Stuart Weitzman one more so I'm going with that! Such cool shoes! Great cheaper price, too. I love madden's. i feel like for the price their stuff is great quality. I always adore Steve Madden -- these are darling! You seem to have read my mind! I've been on teh lookout for the perfect summer wedge. They are so similar: I'm definitley picking the thrift option. Love those Stuart's! great look for less.. totally would go for the Steve's. Wow! They look so similar. Yup I have definitely seen Jennifer Aniston working these great shoes. Love the price and look of the Steve Madden ones, perfect for spring. hi dear. love how you always manage to find almost identical picks here- i don't know how you do it? Oh man the Steve Madden ones all the way. I love me some deals. I actually think I like the Steve Madden ones better. The strap is better looking. But WOW the similarity. Uuugh! I wish i could wear wedges! These bird legs don't handle chinky shoes well. We sell Steve Maddens at Famous Footwear at my store so I would get a discount! Steve Madden on this one! They're so similar, though, it's crazy. Those wedges are super cute! And I really like Steve Madden, so it's not like you're skimping on quality. Not really fan of either one...I want more of a delicate lace-up espadrille if possible. Hopefully this season will provide me with the footwear of my longings! Thrifty is the key here. Great find. Love them both but I am gonna have to go cheap. SERIOUSLY WHAT WHAAAT HUHHH. These look SO similar. I don't understand how you catch these things. It's seriously a talent in itself. Love the Steve Madden ones, they look so similar! These make me so exciting for spring! I can't wait for open-toed shoes again! Ooo nice picks! I do like the leather trim, and that is tempting me...but since there's so little leather, I would be fine going for the Madden. I can't get over how similar they look - cheapies of course! I am excited about espadrilles this year! Oh yes, I can't wait to wear these sandal wedges in the summer! I prefer the bottom wedge part of the Stuart ones but the Steve Madden's are definitely the way to go in terms of that great price!